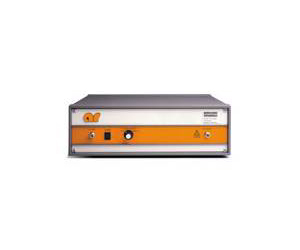 The Model 40AD1 amplifier is a self-contained, broadband unit designed for laboratory applications where instantaneous bandwidth, high gain and moderate power output are required. Utilization of push-pull MOSFET circuitry lowers distortion, improves stability and allows operation into any load impedance without damage. The Model 40AD1, when used with an RF sweep generator will provide a minimum of 40 watts of swept power. The Model 40AD1 is direct coupled throughout, allowing very low frequency signals to be used. Included is a front panel gain control which permits the operator to conveniently set the desired output level. Housed in a stylish, contemporary enclosure, the Model 40AD1 provides available RF power for typical applications such as RF susceptibility testing, antenna and component testing, watt meter calibration, and use as a driver for high power amplifiers. The Model 40AD1 amplifier uses universal input line voltage switching power supplies, thus allowing its use over a wide range of input voltages without wiring or switch position changes.